Along Phillips Avenue, the main street of Sioux Falls, South Dakota, the local theater’s marquee is a tribute to the late Senator and 1972 presidential candidate George McGovern, who was buried last month, and is still regarded as a hero by many here. But with McGovern gone, it seems that the Democratic tradition of decent populism he epitomized was being interred along with him. In his landmark 1981 book, The Nine Nations of North America, Joel Garreau deemed the vast region stretching from the southern Plains well past the Canadian border The Empty Quarter. Along with the western strip of the neighboring Bread Basket that stretches up from central Texas through the Dakotas, the Quarter—covering much of the nation’s land and home to many of its vital natural resources—is in open revolt against the Democratic Party, threatening the last remnants of prairie populism. Although long conservative and GOP leaning, the Empty Quarter—containing Nevada, Utah, Wyoming, Idaho, Montana, and most of Alaska, along with inland California and Washington and parts of Colorado, New Mexico, and Oregon—has a proud progressive tradition as well. Over the past half-century, many of the Democratic Party’s most respected leaders —McGovern, Senator Majority Leaders Mike Mansfield of Montana and Tom Daschle of South Dakota, and powerful figures like North Dakota’s Byron Dorgan and Kent Conrad—have represented the Plains. The tradition is still revered there, but today’s Democrats are becoming an endangered species as the party has become ever more distinctly urban, culturally secular and minority dominated. While Obama lost most of the Quarter in 2008, this year polls show that he’s likely to be crushed there, despite the booming economy in many of the states. Obama’s popularity has dropped more in North Dakota, which has the nation’s lowest unemployment rate, than any other state. Amidst the growing anti-Obama tide, progressive Democrats in most of the Quarter have been increasingly marginalized, both by their own party and by voters. In the past two years, Republicans picked up a Senate and House seat in North Dakota, and look likely to pick up another this year, along with a Senate seat in Nebraska, and quite possibly another in Montana. They are also poised to claim the only remaining Democratic House seat in Utah, if Mia Love’s lead over Rep. Jim Matheson holds up. By the end of this election, it’s possible that only two classic Prairie Democrats—South Dakota’s Tim Johnson and Montana’s Max Baucus—will remain in the Senate, where they once formed a powerful caucus. The Plains states, plus Alaska, account for 50 Congressional seats and an equal number of electoral votes—more than Florida, North Carolina and New Hampshire combined. Why has this occurred? One problem, notes former Daschle top economic aide Paul Batcheller, lies with the “nationalization” of the Democratic Party—and its transformation from an alliance of geographic diverse regions to a compendium of narrow special-interest groups, so that under Obama, the Democratic Party has essentially become the expression of urban-dwellers, greens and minorities, along with public employees. He also points to “changes in the media”—especially cable TV—that have made it more difficult for grassroots Democrats to make their case for their own interests, outside of the increasingly polarized national debate. At the same time, Obama’s policies—focused largely on constituents in dense coastal cities—have widened the gap between the Plains and the Democrats. It is increasingly difficult to be a successful Prairie progressive when that means striking out consistently against the very industries, from large-scale agriculture to fossil fuels, at the center of these economies. At the same time, the failings of Democratic big states, most notably California and Illinois, are not exactly advertisements for the virtues of modern progressivism. Particularly galling, notes Mike Huether, the mayor of Sioux Falls, have been the huge deficits and expanded welfare spending associated with the Obama Administration. And the region’s self-sufficiency is an increasingly important part of our national debate, especially about energy independence. 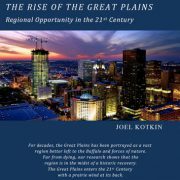 Although often dismissed as a land of rubes and low-end jobs, a study of the Plains I conducted with the Praxis Strategy Group and Texas Tech University found that, overall, it has outperformed the rest of the country in virtually every critical economic measurement from job creation and wage growth to expansion of GDP. The area has also thrived demographically, with population growth well above the national average. 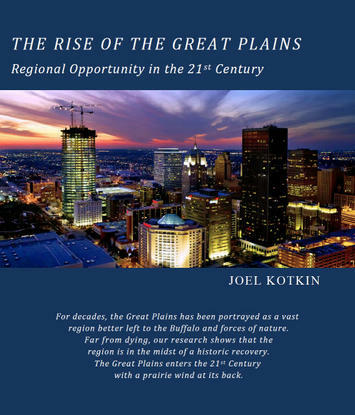 Most of this has taken place in the region’s flourishing urban centers, from Ft. Worth and Midland, Texas to Sioux Falls, Bismarck, Fargo, Oklahoma City and Omaha. This growth includes migration from still de-populating smaller towns in the region, but increasingly includes migrants from the coastal areas as well as immigrants. More people now arrive in Oklahoma City from Los Angeles than the other way around. And these arrivals are hardly poor Okies pushed back unwillingly; the Plains cities have become magnets for educated people. Over the past decade, the number of people with BAs in Sioux Falls has grown by almost 60 percent; Bismarck and Fargo saw growth of over 50 percent, while Oklahoma City, Omaha and Lubbock enjoyed forty percent increases. In contrast, the educated population of San Francisco grew at 20 percent and that of New York by 24 percent. Any coastal denizen who spends time in these cities may be surprised by the tolerance and lack of bible-thumping one encounters there. Social issues, notes Mayor Huether, have never been drivers in the Plains as they have been in parts of the Deep South. A quiet Nordic spirituality prevails here, rather than evangelical enthusiasm; people and politicians generally do not wear their faith on their sleeves. The real issue in the Plains centers around the future of the economy, and how best to bolster family and community; the Obama program, with its interest-group agendas, simply does not translate well in this environment. Ultimately, the red tide sweeping over the Plains is bad news, not simply for Democrats but for the country, part of the trend noted by Batcheller in which moderating regional forces within both parties—New England Republicans and Blue Dog Democrats—are losing ground. Prairie Democrats are crucial for ensuring that producers tangible staples—food, fiber and energy—have a space within their party’s tent, along with the big-city coastal consumers of those resources. Never mind the conservative cliché: If Democrats lose their remaining hold on the Plains, the nation’s parties will truly be split between makers and takers. This region is likely to become more important over the coming decades, providing much of the food needed for world markets as well as significant share of our new domestic energy. Its manufacturing, technology and service industries are also growing rapidly, integrating the area more into the national and global economies. Batcheller, among others, believe that the Plains Democrats may not become extinct, but their future will be limited in the increasingly polarized, and nationalized, political order. On the local level, particularly on key infrastructure projects like Lewis and Clark water project that is being built to meet the needs of Sioux Falls and its environs, Republicans and Democrats are largely in agreement. Neither tea-party extremists nor greens can block progress towards widely accepted local infrastructure goals. One can only hope that the Prairie Democrats manage to survive. They have contributed a unique brand of civically minded, decent social democracy that added much to the national debate. Egalitarian in intent, their brand of aspirational liberalism, fully content and compatible with notions of individual achievement and hard work, offers an alternative to the “know nothing” extremism increasingly dominant in both parties. This tradition of progressive decency could be sorely missed in the years ahead.